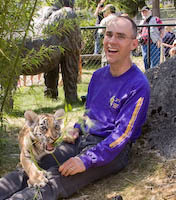 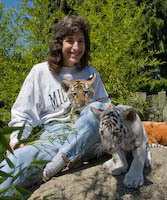 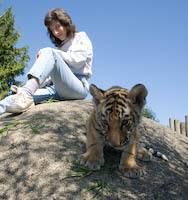 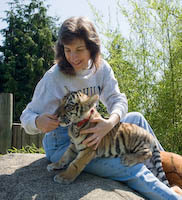 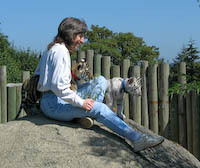 On July 22, 2009, we had an incredible opportunity to interact with two Bengal tiger cubs at the Cougar Mountain Zoo. 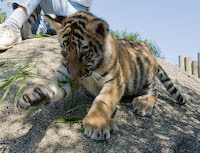 They are brothers, born about 2 months ago, and each weighing around 20 pounds. 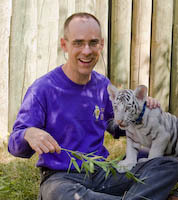 Bengal tigers occur naturally in 4 color variations. 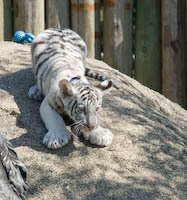 The coloring is determined by dominant / recessive genes, as with eye color. 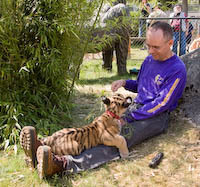 The colors, in order from most to least common are: orange with black stripes, white with black stripes, golden with cinnamon stripes, and snow or pure white (no stripes). 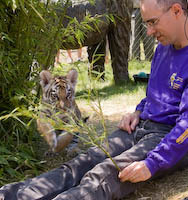 The zoo's two new cubs are the orange and white colors. 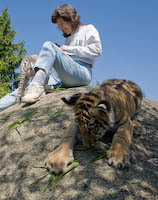 The zoo also has two older Bengal tigers; they are white and golden. 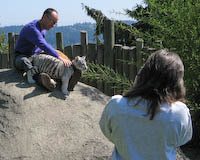 We also checked out some of the other animals at the zoo. 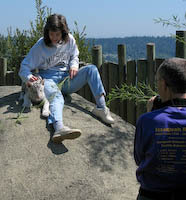 There are pictures of alpaca and macaws at the end of the gallery.